Pre-Raphaelite art may read as more kitsch than revolution. But sometimes, to move forward, you have to look back. One day in 1848, a trio of young Englishmen declared themselves the Pre-Raphaelite Brotherhood. It was an absurd name for a ridiculous idea. 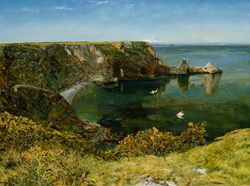 The Pre-Raphaelite Brotherhood, led by William Holman Hunt, John Everett Millais and Dante Gabriel Rossetti, proposed to take art more than 300 years backward. They wanted art to return to the period before Raphael (1483-1520). The Pre-Raphaelite Brotherhood thought they glimpsed utopia in the lost days of the High Middle Ages and the Early Renaissance. 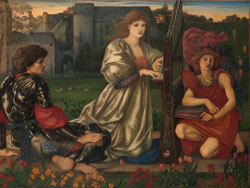 “The Pre-Raphaelite Legacy: British Art and Design” The Metropolitan Museum of Art, New York. Through October 26, 2014.